Update: According to T-Mobile, this update hasn’t been officially released, so you may not see the update as available. A quick note for all you T-Mobile G2x owners out there as a minor update has been released, removed and then re-released by LG. There are some early reports about improved battery life, but mostly you’ll just notice a bump from Android 2.3.3 to Android 2.3.4. There is still no word from T-Mobile or LG on an official Ice Cream Sandwich release — we’re still holding out hope though. You can hit the link to download the Mobile Software Update tool to give the update a go. ← Analyst: T-Mobile To Lose 600,000 Postpaid Customers In First Quarter 2012? That phone is still around? 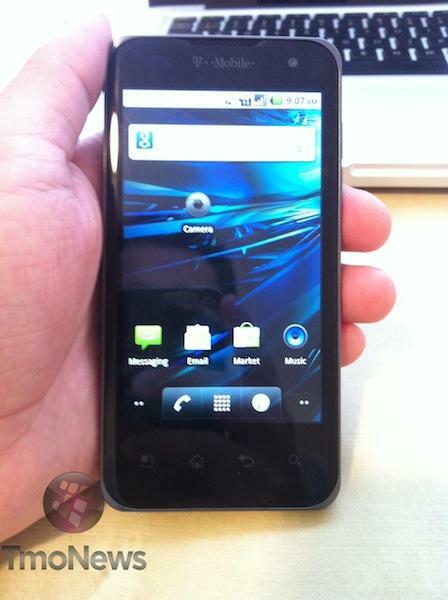 If it were not for XDA and ROOTZWIKKI, I would have major depression about this phone. If I was just a standard user I might not care. However having knowledge of what is out there vs. what I have is a heavy burden to roll with……Thanks LG you’ve really set the tone with this first dualcore…..concerning how you support it……LAME! Wow, i got rid of my G2x last June, I thought it was already dead! lol! Yes,still around (misspost responce to Moneymike) and until my time is up or the SGIII comes out…I’ll be rockin’ it….cause really that HTC stuff just doesnt do it for me. As far as I was aware this update was already pulled down from the mobile update tool. XDA has a kdz file of the update available to flash but the csr on LG Mobiles forum said they have not been alerted to any update. Yep, it’s still around.. I use it everyday and have had few issues with it. I purchased it a day of so after Costco had it in stock. If I waited for LG or T-Mobile to issue updates, I would have thrown this thing away long ago. I been running ICS for while now. While its not perfect, it’s better than the update that was issued a while ago. I am still waiting for the camera update…..
good hardware, bad support. If a supported ICS is released for it, I’ll pick up one off the craigslist…. I feel sorry for anyone who bought this. Just sad support from LG. So sad that I don’t think I would ever consider buying an LG phone in the future. No update available for me!!! should my phone cause me headaches? Did i pay $500 dollars for a headache? shoot it to me, LOOBER GOOBER! I plugged my phone my in this morning and got nothing..LG software update keeps telling me my phone has the newest version installed. If it were stable, i would still have it. I did enjoy it when it was on froyo for it was stable. LG is supposed to male the G4X. If it is good on specs and performance, and can run the in development LTE network, i will switch back to that brand. The G2x is actually a great phone once you find a stable Rom. I love it. what rom do you recommend? can’t decide whether to go with a tried & tested gingerbread based rom or a shiny new ics based one. Does anyone know if there is a way to update directly from the phone? I keep trying to post here and it says I am not allowed?!? soooo, if I have a Mac I’m screwed? You can use parallels and run Windows inside of mac to do the update, I’ve done this with success a couple times. The update is no longer available through the LG support tool. I’ve had this phone since launch with no problems. Loved it before, and love it even more since I was able to do the upgrade (I happened to catch it 2 days ago). If you’re feeling adventurous, here are some steps to try and get the upgrade on your phone http://forum.xda-developers.com/showpost.php?p=25023419&postcount=224. im confused with the lgmobile update thing there’s more then one lg999 which one would i pick to update my phone? When I was with MetroPCS I enjoyed the LG Esteem I had, which was the same phone as the LG Revolution at Verizon, a $560 phone (I know, LOL, what is Verizon thinking). That LG phone was quite impressive. I now have a Samsung Galaxy S II that is rooted and unlocked. I put ICS on it. I was not that impressed so I put 2.3.6 back on it. I think people can get caught up on these updates, convinced that the latest must be the greatest. I am happy with 2.3.6 and am now not in any rush to get ICS. So take that into consideration. Of course personal experience differs and you may want it. Nevertheless, I don’t see many superphones with 2.3.X or later offering up an ICS update. I suspect that is more Google’s doing than the individual manufacturers. And supposedly, ICS will not run on those “older” phones. I know a lot of that is BS. Then again, I can see manufacturers and carriers saying “right on” because if you want an ICS phone this forces you to buy one. Sidenote: Carly on that pop-up ad on this page, with her new look, WOW, WOOT, YUM! TMO sent me one free months ago. It came with GB installed and works great. A tad twitchy on rare occasion. Love the build. When is. The LG.double. play. Going to the ice creams sangwich. Updates any one else. Have a doubles. Plays? seems like LG pulled the update. The update tool says 2.3.3 is latest. worked all day, i get home, and i find out they pulled it? WEAK! Are you able to communicate in a manner the real world understands? You really bought that POS? You don’t deserve ICS for that decision, LOL. Well atleast u didn’t buy it. But yea, the GSB is wayy better than that DoublePlay POS. I feel sorry u had to use it. AOSP ICS is out for G2x. Eagles Blood is working on its second build and it’s fantastic. That’s the power of Open Source. Having said that, it would be wonderful if T-mobile would release a phone that is actually worth replacing my G2x. Dropped my well working G2x got the Amaze and never looked back. The G2x became a great phone once rooted. But got a sweet deal on the HTC and I had to hop on it. The G2X is awesome because it can be easily rooted and flashed with a custom ICS rom, of which there are many, and the resale value has collapsed mainly due to several early bugs and slow updates that destroyed the reputation of the phone. A used G2X in excellent condition can be picked up for less than $200, which is peanuts for a modern dual-core phone that is even supported by cyanogenmod. It’s still the best value phone on the market.